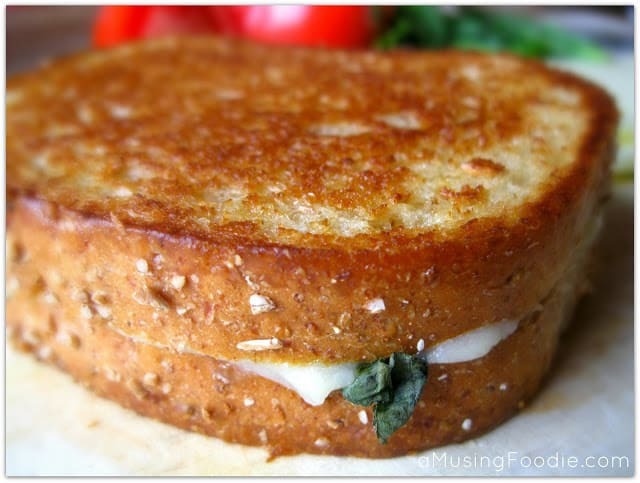 Grilled cheese sandwiches are a weekend staple in our house, and have been since even before my kids were born. Ooey-gooey cheesy goodness, melted between two pieces of soft bread that’s been toasted just enough to become golden and crispy around the edges – is there anything more comforting? My husband and kids are grilled cheese purists: straight up American between two slices of whole grain white bread. Don’t get me wrong, I love a classic grilled cheese as much as the others; however, I also like to be a little daring with my mixes and matches too. One current favorite is grilled cheese on rye bread, with white American cheese and sautéed mushrooms. I get that a couple times a week at my work cafeteria with a cup of their homemade soup – best lunch deal in town at three dollars and change for the meal! 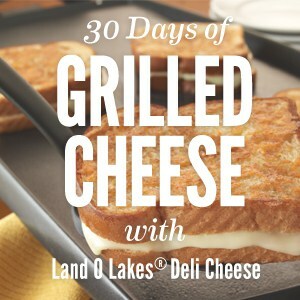 Land O’Lakes and Kitchen PLAY are celebrating National Grilled Cheese Month – April! – by talking about grilled cheese sandwiches for 30 days. They asked if I’d want to contribute a favorite flavor combo to their collection. With spring upon us, I’ve had fresh, clean flavors on the brain. My initial idea was to create a take on mozzarella caprese, using Land O’Lakes®4 Cheese Italian Blend. 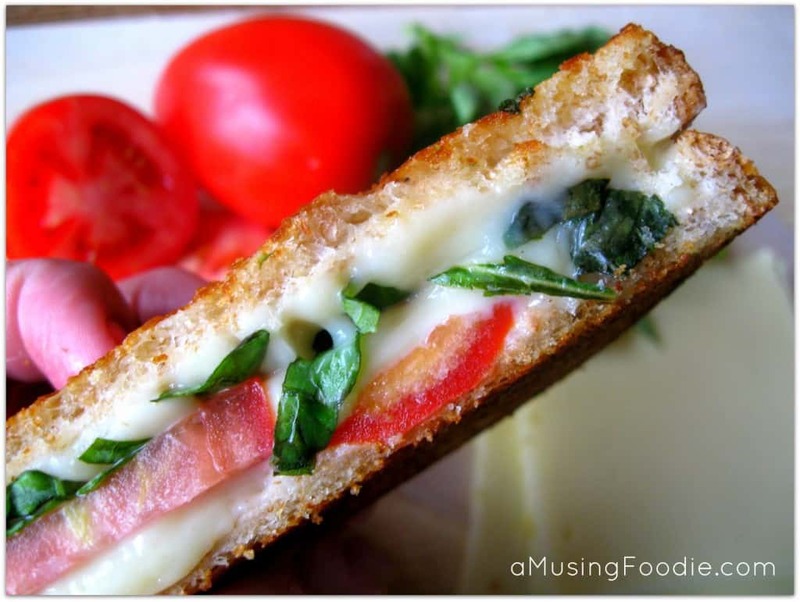 But, when I realized that my local grocery store doesn’t carry that particular flavor, and I had a hungry and tired four year old in tow, I had to decide very quickly if a caprese would work with classic American cheese. Decision: It will work perfectly! Use salted butter that’s been softened in the microwave to evenly coat one side of each slice of bread. It’s important that the butter reaches ALL the way to the edges so that the bread gets totally golden and crispy on every square inch of its surface. Cheese needs to hit both sides of the insides of the sandwich – this may mean multiple slices, and that’s definitely okay! NO SMOOSHING. Be gentle with your spatula; there’s no need to flatten the bread. The only, repeat, ONLY exception is a Panini-style grilled cheese. Land O’Lakes uses only high-quality ingredients to make their cheeses smooth and creamy – the perfect melty consistency for a grilled cheese sandwich. They have also supported the “farm to table” concept for over 90 years, because – get this – Land O’Lakes is a farmer-owned cooperative that consists of independent farms, both large and small. I love that! And don’t miss this: Now through May 1, Land O’Lakes will donate $1 to Feeding America via Pin a Meal. Give a Meal. Visit their Pinterest board for all the details! Warm a medium skillet over medium heat while you prep the grilled cheese sandwich. Butter each bread slice evenly on one side only. Place a slice, buttered side down, into the preheated skillet. Add a layer of cheese, then a single layer of tomatoes, followed by basil and another layer of cheese. Top all of that with the second piece of bread, buttered side up. Let the grilled cheese cook for 4 minutes. Use a spatula to gently flip the sandwich, give it a slight press (don’t squish it! ), and then let it cook for another 4 minutes. The cheese should be gooey and melty, and the bread should be golden and crispy around the edges. If not, give the grilled cheese 1 more minute on each side, or until it’s done the way you want. Let the grilled cheese sandwich rest for 1 minute, then use a sharp knife to cut it in half. Enjoy it by itself, or with a cup of your favorite soup. Disclosure: This post was sponsored by Land O’Lakes as part of the Kitchen PLAY Sidecar series. All opinions given are my own! This looks so good! Thanks for sharing! I moved to FL from MD (Carroll County) four years ago. Enjoy the spring! We don’t have it here in FL. It’s already 90 degrees!